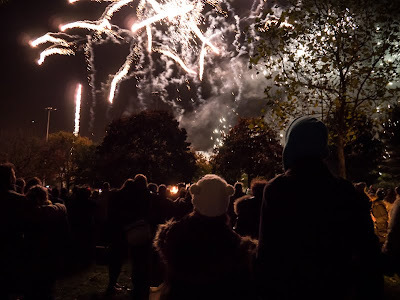 It's that time of year again when across the UK Guy Fawkes's failed attempt to blow up parliament is remembered by letting of fireworks and lighting bonfires. The Prime Minister has missed out this year though, as he is busy selling arms in the Middle East at the moment. Planning a bigger fireworks display perhaps. I was visiting London a few years ago this time of year and I remember seeing the bonfires and fireworks all over the city. Hahaha! You make me giggle. I am so jealous of your bonfire night. I heard the one up in Beverly lasted about an hour and then everyone left for the pubs or home. It's sort of like America's 4th of July celebration, although a tad more maudlin. :) I guess at least the Fawkes fiasco resulted in a great excuse for fireworks for years to come (though perhaps the same can be said of current events). I sympathise greatly with certain comments above and I like the photo too!